It’s National Salad Month, which means it’s time take a stand for salad. Despite its reputation as “rabbit food,” salad is nutritious, and when prepared the right way, delicious! All through May, we encourage you to incorporate salads into your diet – but not just any salads. Create a salad you can actually look forward to by adding toppings, trying new dressings and even branching out with some new greens. 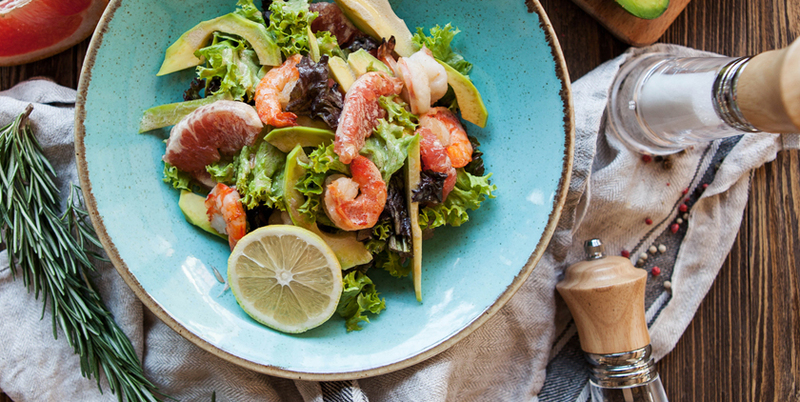 In honor of National Salad Month, we present the best tips and quick fixes to jazz up a salad. Iceberg and Romaine are not the only kinds of lettuce. Try mixed greens, arugula, endive, kale and other leafy green bases. Adding olives, pickles, yellow peppers, capers, and pickled beets can really perk up a mundane pile of greens. Cheese can be a salad highlight. Blue cheese, parmesan, feta and goat cheese lead the way, but the sky is the limit when adding cheeses to salads for fantastic flavors. Just because you add fruit to a salad, does not make it a fruit salad. Don’t be afraid to toss a few grapes or berries into your salad or boost it with chopped apple, pear or mandarin pieces. Adding nuts to salads adds protein and flavor. Walnuts and almonds are salad main stays, while pine nuts, sesame seeds, sunflower seeds, chia seeds, chopped Brazil nuts or hazelnuts add more unique flavors. Mushrooms are as diverse as salads. You can find a mushroom flavor to complement or enhance almost any concoction of vegetables. Get adventurous with chopped shitakes, portobellos, criminos or chanterelles. Embrace your inner gourmet chef and sear up some fresh caught tuna or tilapia! Too ambitious? Canned tuna, salmon and sardines make great salad additions too, plus add valuable protein. It’s not too hard to turn a plain and simple pile of chopped romaine into a salad that screams with delicious Southwestern flavor. Simply add ingredients like avocado, bacon, cheese, corn and black beans. For more protein, add chipotle marinated chicken. Dress it with a creamy cilantro option and for even more flavor, garnish with Pico de Gallo. Take that romaine and mix it up with some diced carrots, crispy noodles, baby corn, snow peas and tangerines, and you have a restaurant-worthy dish. Dress it up with a soy ginger dressing and top it off with grilled chicken, steak or shrimp. Put the finishing touch on with sesame seeds. Want to make plate full of plain arugula pop? Drop some beets on it. Try roasted beets over arugula greens with goat cheese and a raspberry vinaigrette for an easy but deliciously gourmet salad idea. For a great recipe idea for National Salad Month, check out this Sea Bass & Mandarin Salad Recipe.